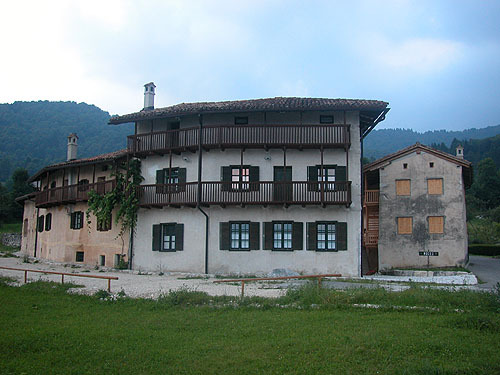 The clustered old Breginj was an architectural pearl of Venetian Slovenian architecture. The ground plan of the village was round with concentric alleys called landrone. Most of the houses were built from stone with wooden exterior corridors (gank), stairways, balconies (linde) positioned on wooden or stone pillars with big overhangs and agricultural frescoes on the facade. The farmhouses were joined by intriguing sets of underpasses and overpasses. 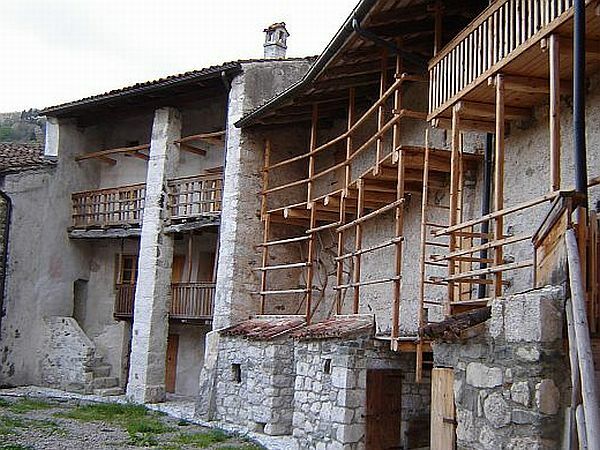 After the earthquake of 1976 the whole village was completely rebuilt. The remaining traditional houses are now a local museum. The oral tradition of the area states that first inhabitants of Breginj were nomads who herded sheep. They had simple dwellings called kazoni. These dwellings were covered by beech leaves. Later the houses were built from stone and covered with straw. The name of Breginj is first mentioned in 1084. In the 15th century it was ruled by the Venetians, in 1521 by the Habsburgs. In 1666 there was a great fire in which 24 houses and the church were destroyed. The reason for the fire was hemp which was grown in the area and which caught fire. After the fire all the houses were built with stone. The farmhouses were connected with their barns and haylofts. People of Breginj lived mostly from animal husbandry and meagre multicultural agriculture. Important products were homemade cheese, polenta and potatoes. In 1805 it was included into Italy, but returned to Austria in 1813. In 1915 it was occupied by the Italian army and became a part of Italy after WW1. After WW2 it became a part of Yugoslavia. The constant changes of overlords brought the people of Breginj no big benefits. Life remained tough and difficult. Breginj was named a class A architectural monument before the earthquake. 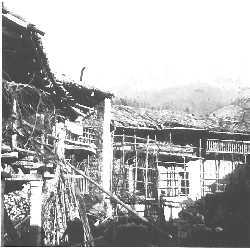 The 1976 earthquake destroyed the old town. Only three houses remain to show you what was lost on that fateful day. The earthquakes which hit north-eastern Italy in May and September 1976 had devastating effects in western Slovenia. There were no fatalities in Slovenia (987 in Italy) but the structural damage was severe. The main seismic thrusts came on May 6th (6,5 magnitude) and on September 15th (6,1 magnitude). The earthquakes have affected an area around 600 km2 and were felt as far as Switzerland, Czech Republic and southern Poland. The worst hit area in Slovenia was the north-western part with Breginjski kot, Kobarid, Bovec and Tolmin. 4000 buildings in the area fell down or had to be demolished and another 12.000 suffered structural damage. Between May and October in 1976 there were around 700 hundred smaller earthquakes which were felt by the inhabitants of the area. After October the seismic activity stopped.